Commodity prices are making headlines on a daily basis. With the constant chatter about deflation as oil prices continue to tumble as well as iron ore, hogs, wheat and copper to name a few, one must ask if we are sitting on one of the greatest pre-inflationary moments in time where lower commodity prices along with a strong dollar can prove to be a perfect time to load up on some these beaten down commodities and stocks. Clearly, among the dividend blogging community many have already loaded up on several energy names anticipating a moment in the future when oil will rise again lifting their investments in the sector. A frequent statement that I read among the dividend blogging members is the fact that many have become overweight in the oil space as this single commodity has grabbed the attention of mass media and has become over allocated in many dividend portfolios. A few weeks ago I wrote an article highlighting many pure play iron and steel companies to offer a suggested commodity alternative to energy heavy portfolios as these companies, like all the energy names, have dropped considerably in price and all pay dividends as well. One must realize that deflationary pressure has been occurring in many other commodities even though oil has grabbed most of the attention. Copper is one of those commodities that has recently dropped tremendously as global demand for this metal is predicting an imminent worldwide economic slowdown. For this reason, copper has received the moniker, Dr. Copper as a predictive force for current and future global economic activity. Of course, with a drop in commodity price comes a drop in the stocks that are tied to that specific commodity. With that being said I’d like to review several pure play dividend paying copper stocks that might find a place in your dividend portfolio as depressed copper prices have brought about depressed copper stock prices as well. First, up is Freeport-McMoRan Inc. (FCX). Headquartered in Phoenix, AZ, FCX primarily explores for copper with significant operations in gold, molybdenum, cobalt, silver and other base metals as well as oil and gas. Currently yielding a very high 6.50% with a moderately high payout ratio of 61.0% based on an EPS of 2.15 the dividend appears to be safe based on current cash flow. FCX also has a decent ten year annualized dividend growth rate of 8.57% though going forward, in the current economic climate, I would not expect significant dividend raises. I guess the trade off for dividend growth is a high current yield with this stock. On a valuation basis, FCX has a current PE of 8.93 which is lower that its five year average PE of 11.2 and the S&P. On a forward PE basis the stock looks even cheaper at 6.4. Next, is Nevsun Resources Ltd. (NSU). A relative newcomer in terms of being a dividend payer, NSU, headquartered in Vancouver, Canada is involved in the exploration for copper, gold, silver, and zinc deposits. Another relative high yielding play at 4.55% with a relatively low payout ratio of 28.6% based on an EPS of 0.34 this dividend also appears to be safe based on current cash flow. With a current PE of 10.48 and a forward PE of 13.1, NSU is considered relatively cheap based on its five year average PE and relative to the market as whole. Again, the evidence of this beaten down sector is apparent just as with oil and iron ore. Finally, we have Southern Copper Corp. (SCCO). Based in based in Phoenix, AZ, SCCO is involved in the mining, exploring, smelting and refining of copper and other copper ore byproducts such as gold, silver and molybdenum primarily in the Latin American countries of Peru, Mexico, Argentina, Chile, and Ecuador. Currently yielding a relatively low 1.70% with a moderately low payout ratio of 30.6% based on an EPS of 1.67, this too is a seemingly safe dividend in the copper sector. While not considered a stellar dividend grower having a ten year annualized dividend growth rate of just 1.44%, SCCO has managed to pay out dividend distributions for about twenty years without interruption. From a valuation perspective, SCCO has a current PE of 16.26 which is in line with its five year average and has a forward PE of 22.10. While cheaper than the market as a whole, SCCO may not be the best value of the three copper plays mentioned here. Even pure play copper stocks share in other metals and commodity price swings as tag-a-long metals such as gold, silver and molybdenum are found together with copper ores. For those looking to diversify out of energy names, copper may present another deflationary commodity play similar to oil that can pay great dividends while you wait for global demand to pick up once again. Are any of these copper names in your dividend portfolio? What do you think about investing in other depressed commodities besides oil? Please let me know below. I think that FCX looks pretty interesting albeit somewhat speculative right now. I read recently that the company may lose its permit to export copper from its Indonesian mine. I believe they are behind in developing a copper smelter at a new mine location. It is probably saber rattling, but it certainly isn’t helping the stock price. The yield looks good and I agree that raises may not be in the cards for a while. The current yield of FCX does make it look compelling. Seems to correlate very closely to a lot of the major oil plays. I too read that permit report about copper exports and not sure how much of an impact or not it would have on the stock price at this point. It seems that the decline in copper along with iron ore and oil is the key reason for all these stock commodity plays being significantly lower than a year ago and not some other secondary reason such as permitting, etc. While future dividend raises might be small or non-existent, at least you are getting paid handsomely to wait till things rebound in the commodity space. Thank you for stopping by and commenting. As for other depressed commodities, I still like to have a bit of precious metals in my portfolio. In Canadian dollar terms gold is now $1610/oz, which is 16% higher than a month ago at $1390/oz. Pretty good appreciation in a short time, but the yellow metal is known to be highly volatile. Against the Euro gold is up quite a lot in recent weeks. It’s interesting how gold has been appreciating against just about every currency except the U.S. dollar. After reviewing these U.S. copper pure plays, FCX really stood out. That current yield and low historic PE makes for a compelling reason to buy. As you mentioned, being a new shareholder at a 6.50% yield is not bad even without a dividend increase this year. That current yield does appear to be sustainable as well even with depressed copper prices. It’s amazing to see how gold has gone up in real U.S. dollars in the last month and how much more it went up in terms of other currencies that have weakened against the dollar. Like you, I also like to own precious metals but do not make it a large portion of my overall portfolio. Some small gold and silver bars here and there for fun and investment doesn’t hurt, even though they do not generate any income. As always, I appreciate you stopping by and commenting. There is a currency war going on The yen is low, the European trying to do QE, US rate has been near 0, the Chinese try to to print money like crazy to stimulate its economy, the rusian rupe is low … Banking stocks maynot going up that much this year because high USD will hurt export, and not good for our economy. We don’t know when some stock will bottom out, but I think PE of less than 10 is very attractive. It’s a good time to coming and average down if necessary. Sitting in a pile of cash do us no good, because inflation will eat it right up. You make several great points about our current world economic situation. In the U.S. the problem of low interest rates have hurt savers for many, many years as inflation eats away any interest “gains” at 1% or less in savings accounts. I guess this is one of the main reasons dividend growth investing has become more and more popular in recent years as we are all looking for better returns for our money than low bank savings rates. We’ll see how QE affects markets outside the U.S. I’m afraid that all this money printing all over the world to prop up our artificial economies will burst in a tremendous fashion and we may see the crazy high interest rates of the 1970s and 1980s sooner than later. Thank you for sharing your insights with us. Much appreciated. As the situation in Greece, Spain and Europe as a whole unraveling. Expect more volatile and it could be 2012, 2013 Greece situation coming back. If we timed the market correctly, we could stand to make a handsome profit from stock appreciation? What do you think about this strategy? There’s no question that we have been down this road before. Not long ago we were talking about the U.S. fiscal cliff and faced economic issues with the PIIGS (Portugal, Ireland, Italy, Greece and Spain). During that time there was a lot of market turmoil as stock and commodity prices turned volatile and dropped. As long term dividend investors we essentially try to never time the market, as it is nearly impossible to do over the long run, but we do aim to take advantage of better pricing and valuations when opportunities like that do come along. Be careful trying to time the market and be wary of catching a falling knife as many dividend investors have done by buying into oil a little too early. Thank you for commenting. I do have to say that 6.5% in FCX is an interesting proposition. I believe that we are in a time period at the moment that will be spoken about for decades. This ridiculously low interest rate environment with QE programs popping up all around the world and currencies run amok… it’s all making for an interesting time to be an investor. The age-old wisdom is to buy when there’s blood in the streets and there is certainly an opportunity to make money in the commodity space if the right wagers are placed. As far as oil goes, I have been considering a position in SU which has done well with its dividend despite only a 3% yield at current prices. I have ultimately decided that the price has not pulled back enough with the company being roughly at where it started 2014 after factoring in dividends despite a +50% drop in its choice of commodity. Since I don’t want to go dumpster-diving for an oil company to invest in and haven’t seen the pullbacks I’d like, I have been taking a look through oil ETFs such as DBO in order to find a suitable way to invest directly into the price of oil. I’m personally of the belief that oil in the $30s would be a no-brainer investment – though I hate to speculate and certainly could be proven wrong. In any event, thanks for taking a look at another commodity at copper does appear to be another way to play this commodity frenzy. I have to agree with you that the FCX yield is something that would compel any dividend investor to consider. It’s very true that we are all in uncharted waters in terms of the eventual outcome of having such low interest rates with so many economies awash in fiat currency to try and generate some measure of inflation. I guess time will tell what our QE will eventually lead to as well as the ECB version and the Chinese version of money printing. Today the dollar is once again king relative to other currencies. I remember not that long ago how everyone left the dollar for dead. 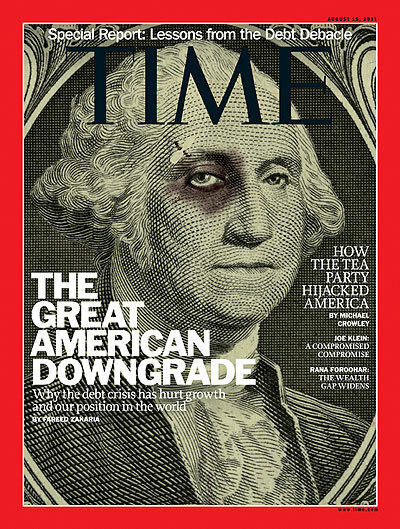 Just look at this August 2011 TIME magazine cover. But, as you mentioned, there is definitely blood in the streets for many commodities and now may be a time to load up on oil, iron ore and copper stocks to name a few. Regarding oil and energy in general you might want to take a look at DNP. Looks like an interesting high yield closed end fund that offers some stability in the energy space. Having been around for almost thirty years it’s not a newcomer to the space. I’m happy to introduce other commodity plays that have been beaten up besides oil and gas such as copper and iron ore pure plays. The commodity blood letting will eventually subside. The question is how will we be positioned when it does. Thank you for stopping by and sharing your thoughts. Like the FCX pick! I hold that in my own portfolio. The historical assets are enough to make it worthwhile but the new offshore oil and gas stands to be a long term driver of significant value. FCX was the stand out among the three U.S. dividend paying copper stocks. After being beaten down in recent months the current yield looks very compelling for new investors. It looks like the dividend is quite safe based on current cash flows and depressed copper prices though I wouldn’t expect much of a raise in 2015. It’s also a pretty diversified name owning oil and gas facilities. It may take a year or two before prices in those commodities rebound but I have a feeling that those who stick with FCX might experience some significant price appreciation with some juicy dividends along the way. Thank you for stopping by and sharing your FCX thoughts. DivGuy recently posted…What Would You Do With 10K? I thought it would be interesting to write about other commodities that have fallen from their recent highs besides oil. It seems that oil gets all the media attention while copper and iron, two other commodities that have fallen tremendously, get little to no attention. It may very well be a great time to load up on commodity related stocks and just sit a year or two and wait for the inevitable tick up as global demand picks up from this slump. The yield on FCX definitely gets the attention of many dividend income investors and getting paid well over 6% to wait is not that bad in our low interest rate environment. Thank you for commenting. I mostly have exposure to Copper via recent purchases in BHP Billiton – as you mentioned in your iron and steel post, I like the diversity of BBL rather than be focused in one commodity. Although that said, they are spinning some of their resources off into a new company South 32 to focus on core assets (coal, iron ore, copper, potash and shale oil). It’s interesting how copper is used as an economic indicator though. BBL has been the single hottest name among the dividend bloggers in recent months following the commodities collapse. I can understand why an investor might decide to put their money into a more diversified play rather than a pure play copper or iron company. However, value has been created in recent months across many of these commodity-centric companies with valuations in many going below historical averages as well as yields going higher than averages. Just something to consider if looking to diversify out of BBL or many of the energy names that have seen a lot of investment in recent months. Thank you for stopping by and commenting.